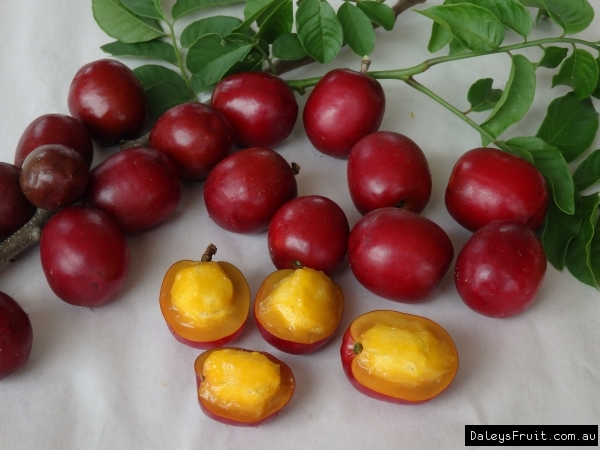 One of the most popular small fruits of the American tropics, the Red Mombin, Spondias purpurea. The red mombin may be a shrub or low-branched small tree 8m in height. The branches are thick and brittle. The tiny, 4- to 5-petalled flowers are red or purple and borne in short, hairy panicles along the branches before the leaves appear which are a beautiful bright-red or purple when young. The fruits are plum-like, borne singly or in groups of 2 or 3,varying in colour from purple to bright-red, even yellow sometimes. They vary in shape and size from 2-5cm. 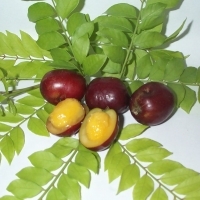 The skin is glossy and firm; the flesh aromatic, yellow, fibrous, very juicy, with a rich, plum-like, subacid to acid flavor. Best eaten fresh for a light refreshing snack, but can also be made into jams, chutney, stewed, boiled or dried.